Don't you just love bright flowers? I sure do! Bright flowers are happy. Happy flowers make me happy! 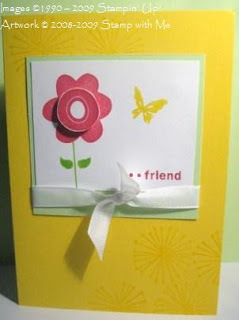 So when I saw a cute little card on Dawn's Stamping Studio while surfing the blogs, I just had to make my own. Of course, here in Australia we don't have the same stamp sets or In Colours, due to our different catalogues (don't worry, that will be fixed next year! ), I had to go hunting for something similar! The pinks and yellows of these beautiful flowers was my inspiration for colour. 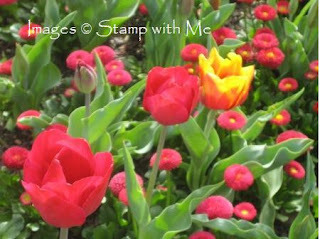 The yellow tulip was the only yellow one in a field of pink. Don't you just love how nature makes it own choices, despite us attempting to interfere! So having seen the bright colours of Floriade, I put the two together and came up with this! It's so simple, but so bright, I love it and am now going to try a few other combinations! In the meantime, here's what I used! You just can't get better than that!